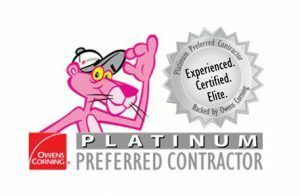 J. Carnes & Son Roofing is an Owens Corning Platinum Preferred Contractor. This means we are a member of a group that is comprised of elite of roofing contractors nationwide. Even with the North East being flooded with hundreds of roofing contractors we are one of the few companies on the Seacoast with this status. Every year contractors attempt to enter the Preferred and Platinum Preferred program and are denied because they don’t meet the strict criteria established by Owens Corning. Earn and maintain certification to offer the Owens Corning extended Roofing Systems Limited Warranties that provide up to a lifetime of workmanship coverage. What that means for you, the homeowner or business property owner, is a quality roof installed by trained professionals backed by Owens Corning.